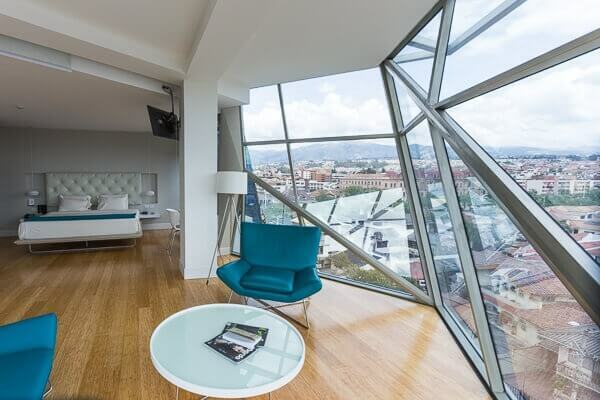 Among a sea of colonial inns and routine business hotels, Zahir 360 brings a splash of modern style to Cuenca in Ecuador. Cuenca has been a real estate hotspot for retirees for more than a decade now, but the number of tourists passing through has been smaller. Those numbers keep inching up, however, enough to justify a few new hotel openings, including the sleek Zahir 360. Your view might not be completely circular, but you’ll have a good one from the regular rooms and a great one from the suites thanks to the quirky architecture of angular glass over steel in a twisted shape. Where the design of the hotel really shines is in the four 360 Suites (rooms 603, 503, 403 and 303). These are much larger (430 square feet) and include a sitting area in a wide corner of the construction. Surrounded on two sides by floor to ceiling glass these corner rooms have a floating, cantilevered feel and a panoramic degree view of the cityscape below. Not for those with vertigo. The modernity goes beyond the look. There are eco-friendly touches seldom seen in this part of the world: bamboo floors, LED lighting, and solar panels. Contemporary furniture in the rooms includes platform beds with cushioned headboards, built-in desks, and sleek bathrooms. Maybe too sleek for some—there’s a lack of counter space and hooks, plus closets are free-standing wardrobes. Public facilities are limited to a small gym and a restaurant, with a routine buffet breakfast included in the quite reasonable rates. This is a city with plenty to do in the center in plenty to see in the villages surrounding Cuenca, however, so most visitors don’t stay holed up in their hotel. This hotel is borderline luxury in some respects and it’s not a good sign that the website is only in Spanish. Considering the only other upscale option here is the historic Mansion Alcazar, however, Zahir 360 offers a welcome alternative for those who prefer the style of the 21st century over that of the 1800s. 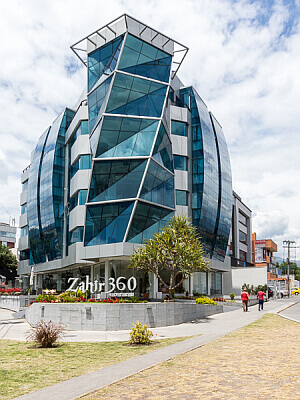 See our detailed review of Zahir 360 in Cuenca.